This entry was posted in Poor Trufan's Almanack and tagged Andre Norton, Cat Rambo, Colleen McMahon, John W. Campbell, Katherine MacLean, Leigh Brackett, Wandering Through the Public Domain by Mike Glyer. Bookmark the permalink. Katherine MacLean’s works are a lot of fun. Snowball Effect is an early ‘memetics’ story in a way. The full quote, sans ellipsis, reads: “He said they were afraid, and that fear makes stupid people do wicked things.” Either way, it applies frequently, and once I type “Brackett” in a search window, it’s the first thing that comes up. She was a guest at a Denver con I was at, and announced that she was going to script the sequel to STAR WARS. There was a screening of one of her earlier movies, THE BIG SLEEP, which she co-wrote with Jules Furthman and that Faulkner guy. It went over well, as did the “Guzzler’s Gin” routine from Red Skelton, which also aired in the hotel’s auditorium, leading to an epidemic of Smoothing that lasted far beyond the con. But I digress. Kip, how cool to have had that experience! Well, hell. Was Leigh Brackett a prophet or a time traveler? Either way, that’s alarmingly prescient. Instead of the ellipsis, I should have just put [F] in parentheses. Ach, live and learn. Cmm, it was a great con. My personal life sucked around that time, but it was a pretty damn good weekend away from all that. Bonnie, I couldn’t say what she had hidden away from mere mortal types like me. Mighty perceptive, though, especially given her politics at the time she wrote the book. Colleen, thanks for this series. There’s a lot of great stuff out there, and I appreciate how you dig it out and lay it before us here. 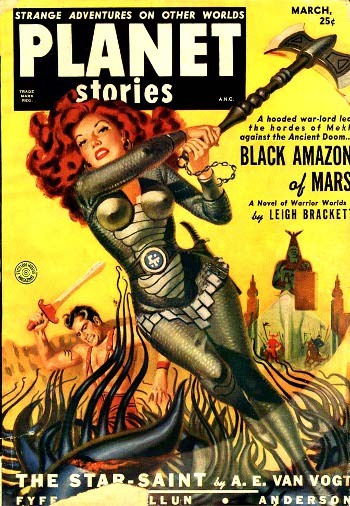 Fascinating — Black Amazon of Mars is visibly the source of People of the Talisman (rather as Against the Fall of Night is the source of The City and the Stars); I never knew Brackett had done an earlier, less-pointed version of the story.